Color? Would you like to add some distinctive color to your landscape? Orange Dream will do that. This tree comes alive in the spring with a burst of Orange leaves that have a hint of red, then as summer moves in the tree takes on more of a green color only to change to a burnt orange by fall. Orange Dream is not easily found at your local garden centers and even on the internet it seems to be pretty rare. Orange Dream is often grown as more of a shrub than a tree because it is fairly slow growing and when grown in shrub form the display of color is truly vibrant because so many more leaves are visible at a glance. The photos taken here are all fall color. I’ll make it a point to some images with spring color on this page soon. Like most Japanese maples Orange Dream needs sunlight to color up the leaves, but up to about 50% shade would probably be fine. I grow thousands of Japanese maples in full sun and we get along just fine. As is the case with all Japanese maples well drained soil that is high in organic matter would be ideal. These do well in zone5. Can they be grown in zone 4? Probably, but there is some risk involved. What are the light/sun requirements for Orange Dream? Looks like a beautiful plant! BEAUTIFUL PLANTS. WHERE CAN I PURCHASE THE LARGER PLANTS OF THIS VARIETY ? Ed, like most Japanese maples this tree needs sun in order to have full leaf color. Even though I’m sure it will do fine in full sun, a little shade at some point in the day is almost always valuable to a Japanese Maple. What’s really important is well drained soil. I just bought an Orange Dream Japanese Maple at Lowe’s for $39.95. It’s about 5 feet tall but poorly shaped. It will need judicious pruning to acquire a decent shape I think. You’re right, and if it needs pruning, prune it. The sooner you prune it the better. Great price, but that’s why you got such a deal on it. But’s it’s still a great value, just needs a little help. These are really beautiful!!! I had a small Red in my front yard. Stunted and got no taller, but leafed out beautifully every year. will japanese red maples grow in southern california near the ocean (2+ miles? Jerry, I’m not sure what zone you are in, but anything over zone 7 is pushing the limit for Japanese Maples. Zone 8 is probably okay for most varieties, but anything warmer than that is probably too hot for them. these are very lovely, but how will they hold up to a MS summer heat? I have very little shady around my house and I find the Japanese Maple requires some shady and are not tolerant of heat/drought. Marlene, lots and lots of sun is hard on the leaves. During the really hot months they should be watered weekly, especially in well drained soil. They are pretty tough up to and into zone 8. The Japanese Orange Maple is beautiful. Will it survive in a Zone 4 climate? We have a place in Bevent WI. Kathy, I am growing all kinds of Japanese Maples in zone. Zone 4 is borderline for them. Probably be okay for any number of years, but even here in Ohio we occassionally get a winter that hits them hard. For me it’s worth the risk. I just can’t imagine not having them in my landscape. Do you have specifications on it? Height, width,Etc. Maples? I live in zone 4. Would be interested in getting some of these, but March is still winter in our area. Mi? We’re in Traverse City. Jap. Maples are very hard to root from cuttings. One would need rooting hormone to do so, and even that’s tough. Is this a full-grown tree? It’s a beautiful tree and would be great as a bush. they sound nice, do you sell these? I LOVE, LOVE, LOVE Japanese Maples. Tell me where to get them for $1.35. He full of Manure. He will tell you if you send him $29 first then over 200 later. unless the shipping is $5 each! plant ! Mike, really like the looks of the Orange Dream Maple. So are you teasing us? I have never seen them…..where can they be gotten? I would like to buy some maples to go with my ginkos and monkey pod trees. Do you sell them? Let me know. I’m a plant geek too but we have a truck garden,, and sell at market when we get produce. Yes I would like to try these out her in California. Maybe some of your other varieties as well. Will these grow in zone 4 and 5? I would love to try some! I had one but it didn’t make it! Mike these are beautiful. I would love to start growing these, one problem, deer. They eat everything I put out, even come on my porch to eat my plants. I love your comments. Keep up the good work. How are they in zone 9? wood like to buy 20 of the orange Dream maple. Mike, are you selling the japanese maple orange dream yet ? I am interested !!! oh wow, These are just beautiful… This would be one of those eye openers when cars pass by and see these.. Just love it… Thanks for sharing Mike..
Mr. McGroarty, thank you for showing us the photos of a Japanese maple tree. They are beautiful. Afternoon, Do you have any of the orange trees for sale? Also do you have any of the variegated maples? Thanks! I planted one of these for my client it was so pretty. I do have a weeping red Japanese Maple that outstanding in fall. Thanks for the posts. can I start buying these yet? I love all that you’re doing and selling. I most love the Japanese Maples. I live in Phoenix, AZ, and have “lost” many Japanese Maples that I have ordered from Catalogs. My question is–I see you have a List of different Japanese Maples–will ANY of them grow in Phoenix? I’m originally from Mass. and really Miss being able to grow almost ANYTHING I want! I planted my first Japanese Maple this past summer,I also prunned it in the fall,now I’m hoping I didn’t kill it. I like the orange dream maple what a burst of color that would be. Mike, The Japanese Orange Maple is beautiful. Would love to have (3) some for my yard, but, would they survive in the hot Texas climate? I have ordered plants from northern nurseries before and had them to die due to the heat. Let me know what you think and the cost for 3 if you advise. 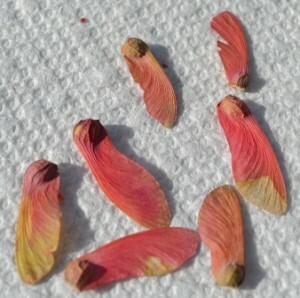 Curious about the Japanese Maples…what are the needs as seedlings. I’ve a decent sized back yard, but is mostly shaded. Libby, young Japanese maples actually appreciate some shade, but after the first few years they need at least 50% sunlight in order for the foliage to really come alive with color. I love Japanese Maples and this Orange Dream is wonderful. It would look great with my Peach Melba Heucheras. Ha! Peach Melba Heucheras, you have good taste in plants! Colleen, I prune all of my Japanese maples to make them nice and full. If you keep it from growing tall it will grow shrub like with lots and lots of foliage visible. funtastic color, calm and easy. What zones are they good for growing in? Chad, thank you for buying my system. I wish you the best of success, this really is a fun business! Sharon, they are fairly slow growing but would do fine in Kansas. what is the hardiness zone recommended for these beautiful plants? John for the most part they do well in zone 5, zone 4 could be a little iffy and probably up to about zone 8 as far as heat tolerance is concerned. I don’t have a web site, but I am going to asvertize it every time I see one there used to be one in the yard behind me. Ever chance I get to tell some one about it I will advertize you so maybe you will get a lot of orders from Kansas City Missoupri, and. if you want to send me one or two I would appreciate it. i will have to get someone to set it out since I have been really sick all this past summer, I was in the hosspital twice andd slowly gettimg my strength back and hope I will be gardening somenext summer. Bless you and your column I have really enjoyed it wwhile I was ill.
Hello Mike, How would these trees handle the South Ga. climate. I would really love to have some in my yard. Susan, not sure what zone that would put you in. Many, many Japanese maples are grown and sold in Georgia but at least some shade, like afternoon shade would probably make the tree happier. when and where can I get an Orange dream? Will these grow in a large pot? How tall do they get? I don’t have a large yard and would like to know if they do ok in droughts? Susan, they can be pot grown, but it depends upon what zone you are in. If you are in zone 6 or colder I think you’d be safer with them in the ground for more winter protection. They certainly don’t require a lot of water, do not like wet soil, but in time of drought I would water at least once a week just to be safe. Rachel, at this time I am not shipping any plants. In a year or two we will be selling Japanese Maples locally, but I’m not sure if I’ll ever get into shipping them. But I have customers that do ship, stay tuned for that. Acer palmatum ‘Orange Dream’ (Orange Dream Japanese Maple) * Part shade * Zones 5-9 * 8-10′ tall * Origin Japan Rare in cultivation! Stunning Orange and red new growth! I think you better be answering a lot of the questions as some of them are mine too. Zone 4 South exposure?? Soil? Water? Marge, zone 4 is the edge of the hardiness zone for Japanese Maples. If were me, I’d take the chance. Life’s just too short to not at least try and grow them in your zone. Soil? They like a well drained soil, do not like to be in wet ground. Soggy wet soil will kill them. Southern exposure is okay, I grow them in full sun. Betty, the short answer is probably not. I know people have grown Japanese Maples in Florida, but probably more north. They need a dormancy period and in your zone some shade would really help. But they should freeze in late Nov so they can go dormant. Mike, I want to grow a living privacy screen about five feet high by six to eight feet wide, in zone 5. What do you recommend? At age seventy I want something that grows fast. Patty, I’d suggest Burning Bush. They grow about 12″ a year so if you can find 30″ plants it won’t take too long. They are not evergreens, but evergreens are more expensive and much slower growing. Things like forsythia grow much, much faster, but need a lot more pruning. mike,just got the cd’s on inside secrets of selling info. and the family really liked your books for christmas. hope the knife and billfold come in handy. oh, and could you tell me the nursery where you buy 1.35 jap. maples. thanks. Jeff, thank you very much for the knife and billfold. I can’t post wholesale sources on this blog, but there are a couple of sources in the wholesale directory as well as the emails in the growers Ecourse. The source that I’ve used for years is in the directory. Actually I just bought some for $1.06 each for March delivery. They are georgeous. I think I’ll look into getting some! I am confused about the “zone” numbers. I have two different zoning systems: The American Horticultural Society’s Heat Zone map rates my area as a 1 – 2, the USDA cold zone map rating is 8B. The USDA system seems more prevalent on the web, but I’d just like to check which system you are using, and if you know of any other systems (my caregiver INSISTS that we are a FOUR based on some other rating system. Also, I have a huge yard and NO GRASS–everything organic. I already have about 400 plus sq.ft. in raised boxes (disabled gardener). 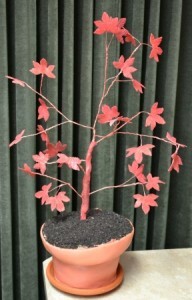 Being Canadian originally, I love maples and have a gorgeous Japanese Lace Leaf (11 years old) and a 5 yr. old red barked maple (any more of a formal name I do not know). I would love to grow these little beauties, both for myself and others. Feedback? Karen, for the most part I use the USDA zone map for cold hardiness since most plants aren’t rated for heat zones. People in hotters zones wish more plants were, but they just arent. hi Mike, I’d love to have this maple in my yard but I live in northern wis., the pink zone. How will it do up here? Marilyn, they seem to do well in zone 5, but you’re probably in zone 4. Not so sure about that.